An enormous dam is currently being constructed on the 4th Nile Cataract in Northern Sudan. After its completion in 2008, a 170-kilometre stretch of the river valley will be flooded. A unique cultural landscape will forever be submerged in the waters of the new lake. In contrast to the construction of the Aswan Dam in the 1960s, for the 4th Cataract there is no UNESCO campaign to react to this situation, to document the ancient sites and thereby preserve them for posterity. However, without archaeological study of the area, a whole chapter of humankind’s history, central to the understanding of Nubian cultures and of the development of African civilisations will be irreplaceably lost. With this background in mind, the Department for Northeast African Archaeology and Cultural Studies at the Humboldt-University Berlin has taken responsibility for a 40-kilometre sector in the centre of the area to be flooded. The objective of the project, which began its activities in the area with a first survey in spring 2004, is to systematically explore the region, record all archaeological sites, and examine the most important ones through excavation. a group of four larger and several smaller islands within the adjacent part of the river. The names of those islands are Us, Sur, Sherari and Shirri. They are up to ten kilometres long and reach a width of several kilometres. The largest, Shirri, has an area of 30 square kilometres. On the archaeological map, the region between the 4th and 5th Nile Cataracts has long been a terra incognita. Since the early 20th century, scientific exploration of the Sudanese Nile valley has concentrated on Lower Nubia, i.e. 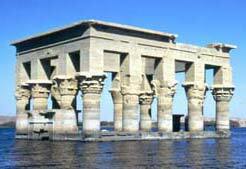 the area now covered by the waters of the Aswan Lake, and on monumental sites of Upper Nubia. On the basis of such research, the sequence of ancient cultures in the Middle Nile Valley could be established. Prehistoric periods, especially rich Neolithic cultures, are well attested in the Nile Valley as well as in adjacent areas of desert. Around 2,500 BC, these developed into the kingdom of Kerma, with its centre on the 3rd Cataract. A first southward expansion of the Pharaonic Egyptian state in the early 2nd millennium BC did not reach Kerma. Only around 1,500 BC, in the course of a second wave of conquest, did the Kerma region and the areas up to the 5th Cataract come under Egyptian control. In the 8th century BC, a local population with a core area at Napata, south of the 4th Cataract, gained strength and was finally able, in turn, to conquer Egypt. It entered Pharaonic historiography as the 25th Dynasty. Although this episode remained short-lived, the Kushite state, which came into existence as the result of these developments, maintained control of the area between the Egyptian border at Aswan and the regions south of modern Khartoum for a millennium. The successive movement of its centre of power to Meroe, located further south, resulted in the differentiation of an earlier Napatan and a later Meroitic period. In the 6th century AD, Nubia was christianised by the Byzantine Empire. The three, later just two, Christian realms of Nobadia, Makuria and Alodia existed until the 15th century, when they eventually succumbed to Ottoman Egypt in the North, and to the Kingdom of the Funj in the South. Christianity was subsequently replaced with Islam across Nubia. Overall, the area of the Middle Nile Valley can be described as the second cradle of complex societies in Africa, at times even surpassing its northern neighbour, Egypt. While archaeological research in Sudan concentrated on reconstructing the cultural sequence and filling it with historical detail, many questions regarding the everyday life of non-elite sections of society, of marginal groups and of their roles within the historical and cultural sequence, remain open so far. Even more disturbing, there is still no clear understanding of the constants and discontinuities between the individual periods, such as the development of the Kingdom of Kerma or the Napatan dynasty, or the final collapse of the Meroitic state. To elucidate the reasons for these developments, necessary for understanding the historical events that form the tip of the iceberg that is history, analysis must be extended to the deeper strata of local societies, to rural area and to the marginal zones of the grand centres. Some such answers lie in the region of the 4th Cataract. As was already shown by the first H.U.N.E. campaign in spring 2004, the area is unexpectedly rich in archaeological sites from all periods of Nubian prehistory and history, from the Stone Ages to the Islamic period. A comparable situation to that on the 4th Cataract existed for the over 400 kilometre long Nile Valley of Lower Nubia, which is now entirely submerged by the waters of the Aswan Lake. Before its flooding, the area was explored by three large-scale archaeological missions. The final one of these, the UNESCO-campaign of the 1960s, even included the dismantling and re-erection of entire buildings. Such spectacular measures, however, are only second in importance to the documentation and partial excavation of over a thousand sites. The information accrued in that process remains a key source for the reconstruction of Nubian history. Every site that remained unreported, every area that was not surveyed then, will forever be missing from the archaeological map – a loss not only for us, but for all future generations and for our understanding of the history of our species in Africa.